Each dock offers dual display outputs, with the TB3DKM2DP offering a pair of DisplayPort 1.2 ports, while the TB3DKM2HD includes two HDMI 2.0 ports. Both are capable of supporting two 4K-resolution monitors at 60Hz, but the DisplayPort model can use both at the same time to drive a single 5K monitor at 60Hz. While the dual HDMI doesn't have 5K support, it does offer slightly more utility than the DisplayPort version. The same USB 3.0 Type-A port is available on both, positioned next to the display outputs, with the HDMI-equipped dock also offering a secondary USB 2.0 port. At the end of the row of ports on both units is an Gthernet connection capable of communicating over a wired network at up to 1 gigabit. A single 7.9-inch Thunderbolt 3 cable connects the docks to the host Mac. As the devices are bus-powered, there is no second cable required to supply power from an outlet, but it also means that it cannot be used to recharge a connected MacBook. Housed in an aluminum enclosure measuring 4.7 inches by 2.4 inches by 0.7 inches, are small enough to be easily carried around with a MacBook Pro. They are also lightweight at 5.1 ounces each. StarTech is selling the Mini Thunderbolt 3 Dock with Dual DisplayPort for $163.99, but currently can be acquired from Amazon for $121.99, while the Dual HDMI version is priced at $182.99. 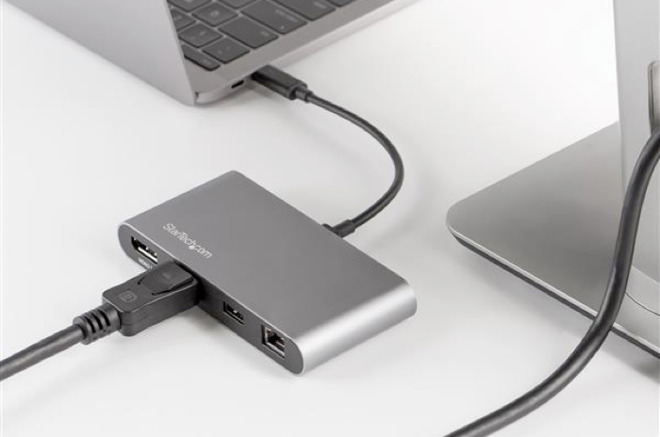 For those looking for an alternative stationary dock, StarTech revealed another Thunderbolt 3 dock in March, offering an SD card reader, dual 4K display connectivity, USB Power Delivery 2.0 of up to 85 watts of power, Gigabit Ethernet, USB-C and five USB 3.0 Type-A ports.